Mythware Classroom Management Software for Linux | Planet TechEd Inc.
can grantee the teaching & learning efficiency maximally. the students to learn and communicate with each other and between groups. Ubuntu Classroom Management Software benefits the instructor to develop an interactive teaching process and make students focus on class. Instructor can broadcast his/her screen to all or selected students in real-time, choose one student to do the demonstration, or start a quiz to test the teaching efficiency. By displaying one student’s screen on other students’ computers, instructor can let the students share their work and highlight creative solutions or common problems. Instructor can play media files on his/her computer and broadcast the media to the entire class. Students don’t have to download the media file. And instructor does not have to share the media file with students. The process uses streaming media via networking. Now Net Movie supports the MPEG files (*.MPG, *.MPEG) and DVD Files (*.VOB). 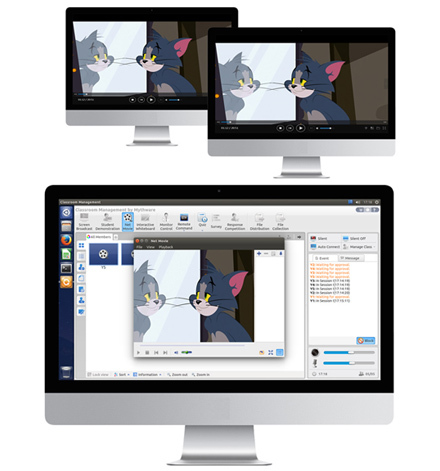 Screen Broadcast is one of the most important functions of Mythware Classroom Management Software for Linux. Instructor can broadcast his/her computer screen to one or more of the students in the class, in either Full Screen or Windowed mode. With Linux Classroom Management Program, instructor can monitor the desktop of the students, assist students through remote control and chat. To improve the learning efficiency, teacher can also blank the student screen to gain attention and make them focus on the class. Using Linux Classroom Management Software, instructor can monitor the desktops of the students. The monitor window displays images of students’ screens. Instructor can simultaneously view multiple students’ screens. Also he can view an individual student’s desktop in a windowed or full screen view. In order to gain one or more students’ attention during the process of class, instructor can blank students’ screens. A blank screen is an amazing thing. Instructor no longer has to compete for the student’s attention. When instructor blanks screens in his/her classroom, all students’ keyboards and mice will be locked at the same time; websites, games and assignments disappear in one click. Mythware Linux Classroom Management Software allows instructors to shut down all students’ PCs with only one mouse click, reboot all students’ PCs, and execute an application on a student’s PC remotely, all without leaving their computers. 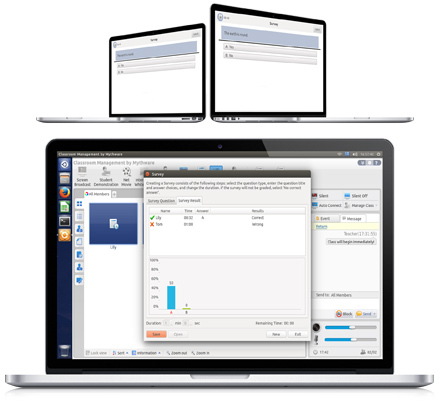 With a practical set of features, Mythware Ubuntu Classroom Management Software for Linux enables instructors to assess student progress by creating and administering quiz papers. Instructors can also give students an instant survey comprising a single question, which can be a useful tool for evaluating individual learning during lectures and discussions. Mythware Classroom Management Software for Linux helps the instructor to manage the class more convenient and easier. Instructor can manage Class Models by deleting or activating an existing Class Model, ask the students to sign it at the beginning of class, distribute or collect files from all or selected students. Instructor can ask students to provide student ID and other information at the start of class. After all students have registered, instructors can export the student registration details to a file. With File Distribution and File Collection, instructor can send documents, collect tests and distribute assignments in his/her classroom instantaneously, without having to pass out any papers. This means all these can be done in a paperless way which is more convenient and environmental. In order to facilitate the quiz function, we have added a new part in this version – Quiz by Answer Sheet. This updated function supports students to answer questions either on answer sheet or on quiz paper directly. A new question type – hand writing question is added in this version. With this new question type, teachers can set some questions which need to be illustrated by drawing. The “unanswered button” in this version will be useful for students to locate the unanswered questions. If the teacher wants to know whether the students have grasped the teaching content during the class, he can use this function to test students’ learning outcome. Teachers can ask the students to answer the competition questions vocally or by entering text. Also, students can answer questions by demonstrating their screen and showing their operations to other students. All those competitions can be done individually or in groups. Help the user to know what classroom management for Linux can do in concise sentences and words. Find all the features of classroom management software for Linux in this feature list. Guide every user to use classroom management for Linux easily and quickly.